SEE THE PREVIOUS POST FOR THE TRIP REPORT AND MORE PHOTOS! As lyrical as that sounds, it is damn hard to do when you cannot tell where the water ends and the sky begins. And for four days out of five, that’s precisely what we were looking at… inbetween rain squalls that would have made Moses reconsider his contract. We knew there might be some unsettled weather when Beryl, the earliest named tropical storm ever, swept northward between the Bahamas and the east coast of the USA a few days before we arrived. But this was the Bahamas where storms quickly pass. Behind them is very often some of the best fishing to be had. Unfortunately for us, the unsettled weather morphed into a socked in high overcast sky interspersed with bilge-pump testing rain and sphincter-puckering lightning. On the flip side, we had a very experienced crew with the right attitude, a great sense of humor and a full cooler of Kalik. Damn the torpedoes full speed ahead, we have not yet begun to fight, and all that. Load out day: Ezra fetched Mike Kotrick and me from our hotel and we motored to the airport to pick up John Frazier [John Frazier is the editor of Fly Fishing in Saltwaters Magazine - Ed.]. Sitting on a bench outside the terminal a local taxi driver strolled by and asked if we were waiting for our ‘daughters’ – nudge, nudge, wink, wink. I won’t speak for Mike, but I admit I am in the later half of middle age and after thinking about it, I had to smile that he thought I was young, virile and rich enough to afford flying a mistress over for a rendezvous in the Bahamas. John’s plane arrived with the usual island timeliness. And because he’d signed on for this tour too late to submit his beverage order, he stopped to collect another case of beer (which put him well on the way to passing the “hope this guy isn’t a weenie” test). Off to the boat ramp we went. Sid met us at the ramp, we loaded all the luggage and groceries into the Carolina skiff, and had a pleasant ride out to the Destiny II. The Destiny II is a graceful, spacious, well-appointed catamaran that would be our home base for this trip. Our skipper was Dave Calvert, experienced open ocean racer and world renowned designer of racing sails. First mate was Steve Hogan, a chef extraordinaire who trained at a northwest culinary academy with a wealth of stories from his freighter trips in the Bering Sea. Sidney and Ezra Thomas would be our guides and Greg Rolle would maintain their lobster boat close by. As we pulled up to the Destiny II, Dave was lowering a mesh bag of conch back into the water off the stern of the boat. Steve mixed us up a batch of blue ribbon conch fritters, combined with cracked conch, cold Kalik and a spectacular sunset heralded another epic trip. Fishing Day 1: It was mostly sunny (or partly cloudy, depending upon your point of view), with the typical breeze from an atypical southwestly direction. We had good tides: high around 8am and dropping most of the day. 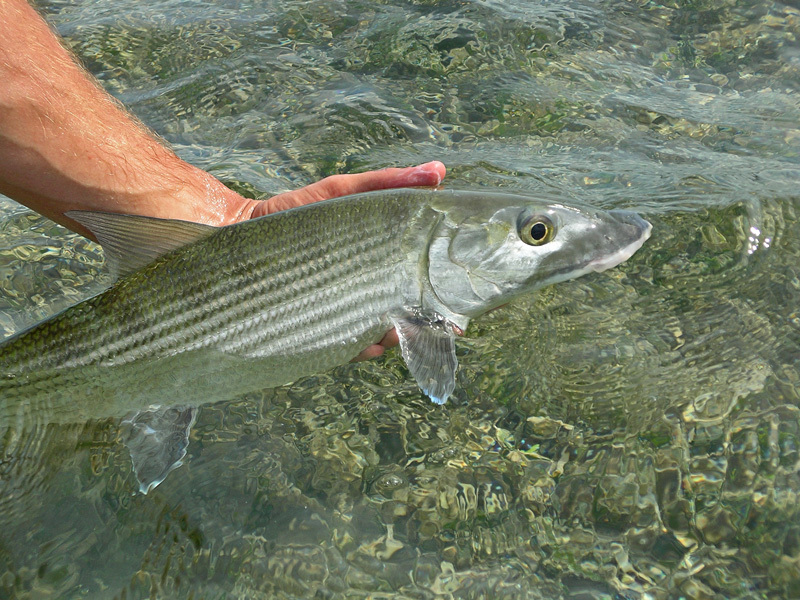 Everyone caught bonefish with some most excellent tailing action late in the day within sight of the catamaran. 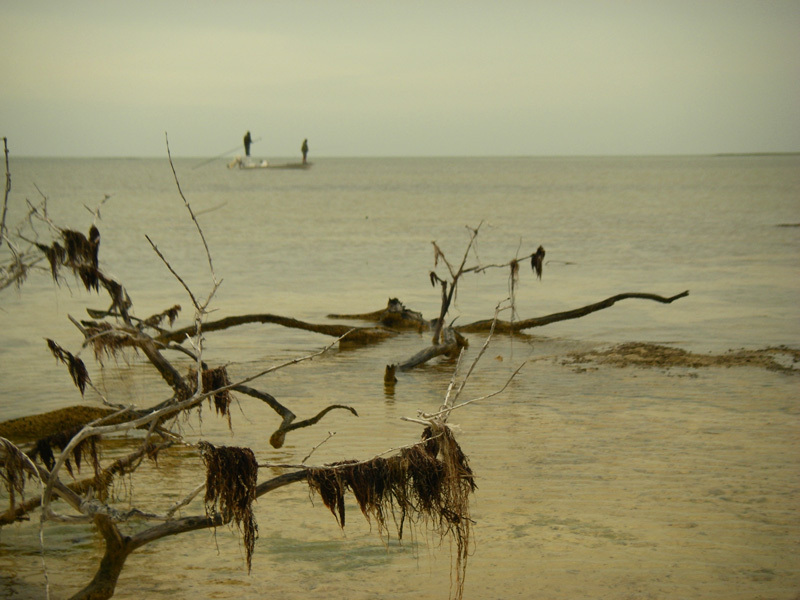 The bonefish were all strong, healthy fish between 5 and 8 pounds. Mike and Ezra saw a dozen tarpon during the morning. Sid, John and I saw one big tarpon laid up in about four feet of water. No tarpon were harmed on this day, but we inflicted serious damage on the Kalik army that evening. Fishing Day 2: The breeze shifted to the south and strengthened. The partly cloudy sky became mostly cloudy and by evening we knew rain was on the way. The wind and tides limited our fishing options, but with Sid and Ezra’s superb effort we all managed to check our backing knots with the help of a few bonefish. Dave and Steve moved the Destiny II to a better anchorage. And then the rain came down. We opened the scotch and the rum and broke out the dominoes. 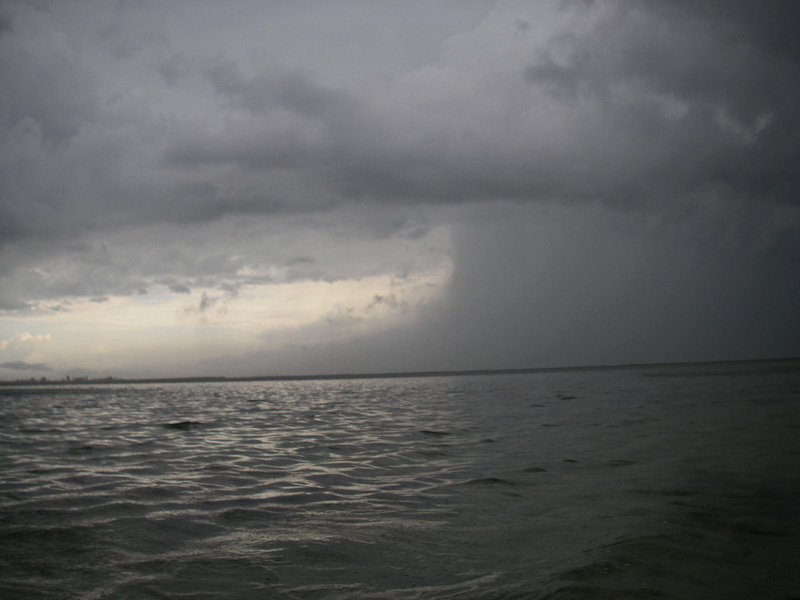 Fishing Day 3: This was a day of dodging rain squalls and lightning. We all agreed a little rain never hurt anyone, but lightning was a totally different issue. At one point during the morning, Mike felt his rod tingling in his hand and Steve actually received a little shock. He said it was sort of like when you’re jumping a car battery and accidently contact the hot terminal and the car body at the same time. In between rain storms, Ezra, John and I checked out an area Ezra calls “The Honey Hole”, known for holding tarpon. 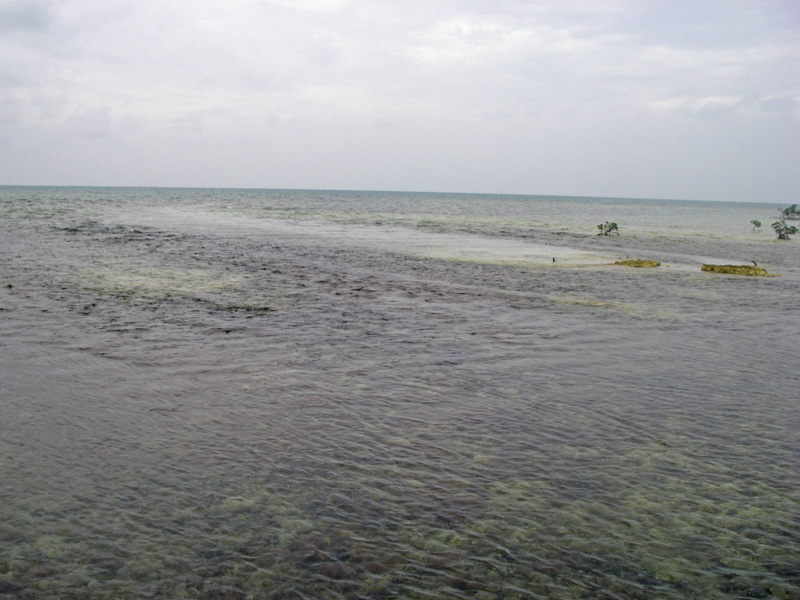 The Honey Hole is a small bay surrounded by mangroves with at least four feet of water under them even at low tide. John was gracious enough to let me stand up on the deck with a 9 foot graphite lightning rod in my hand. Maybe gracious isn’t the right word, but it worked out okay because we saw three tarpon cruising along under the mangroves. Of course just then the no-see-ums and mosquitoes launched their attack and the rain began to spit again. But we stalwart fellows weren’t about to let a few miniscule, albeit bloodthirsty dipterans, or the threat of Mother Nature’s Electroshock Therapy interrupt our reverie. I laid a 30 foot cast into a little gap in the mangroves just ahead of the tarpon. The lead fish immediately turned toward the fly, sauntered over (if a fish could saunter this one did) and calmly snarfeled my cockroach. There is no other way to describe it. It was almost slow motion. Choosing to strip strike rather than slap the mosquito in my ear, I hooked the tarpon and… then it just sat there. At least for a second or two it continued to calmly saunter around. I heard Ezra say "He don’t know he’s hooked yet." Of course the fish heard that and immediately took to the air between us and the mangroves. Ezra poled the boat away from the mangroves while I tried my best to keep a tight line, bow to the jumps, and ignore the 55 no-see-ums chewing on my leg. John cursed the rain that prevented him from getting out his camera. With the fish more or less safely away from the mangroves, I managed to survive two or three more jumps and bring the leader to John’s hand, who by then had his GoPro camera out trying to get some underwater video. As the adrenalin drained from our systems, the severity of the bug attack became clear. John expertly popped the fly loose, we guessed the tarpon at about 45 pounds, gave it thanks, and then said to Ezra "Get us the hell outa here." The rest of the day was spent checking shorelines for cruising bonefish and later as the tide fell looking into back bays and channels. Everyone stung a few more bonefish before we called it a day. At one point we caught a few small gray snapper and were preparing to tease in some spinner or sticky-nosed black tipped sharks. This plan was interrupted by the site of a couple cruising bonefish. With reinforcements from Johnny Walker and the Cuban rum & pineapple contingent, the Kalik battle was still touch and go. Fishing Day 4: It was time to move south. The druids had spoken and the best chance of fishing with the given weather and tides was to move south. So we donned rain jackets, checked the compass, and pointed the Beaver Tail skiffs south. Dave and Steve and Greg would follow with the Destiny II and the lobster boat. It was a brilliant maneuver and we’re nominating Sid and Dave for commendation medals (or at least a firm slap on the back and pip, pip, well done lads). We found low water and hungry fish. Mike, Ezra and I chased fish all over, under and through some mangroves laughing our heads off the whole time. The tide fell fast and hard when it finally fell. Ezra brought us to a broad flat with a strong out-going tide. 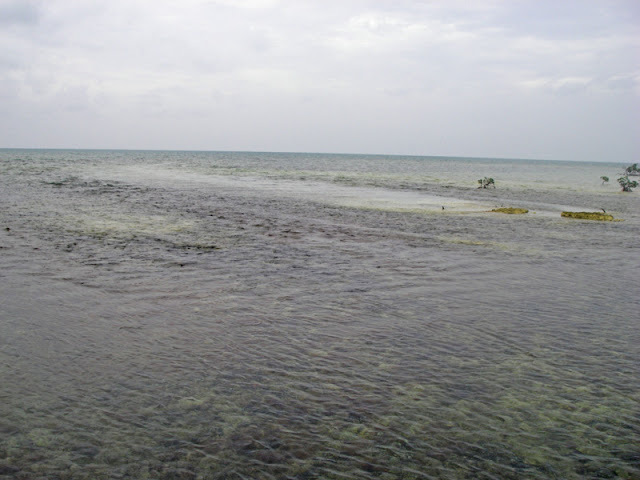 Looking up current into the lagoon, we could see tailing bonefish. Ezra said they had to come out sooner or later and we’d ambush them here. I asked about getting out of the boat so both Mike and I could fish. Ezra said to sit on the side of the boat and test the bottom. I did and it felt fairly firm. Ezra said “Must be okay then” so out I hopped. Ezra poled Mike over closer to the channel and deeper water. I took a dozen steps and proceeded to sink up to the tops of my gravel guards. I thought to myself "This looks like a good spot for an ambush" and decided I didn’t need to wade any farther. And the fish did indeed come by. I spooked a couple when the fly bellied by the current hung up on the bottom before they could find it. But finally did manage to hook my best fish of the trip. The tide of the Kalik battle turned that evening and the war council decided there would be no surrender. Fishing Day 5: The morning actually looked promising. 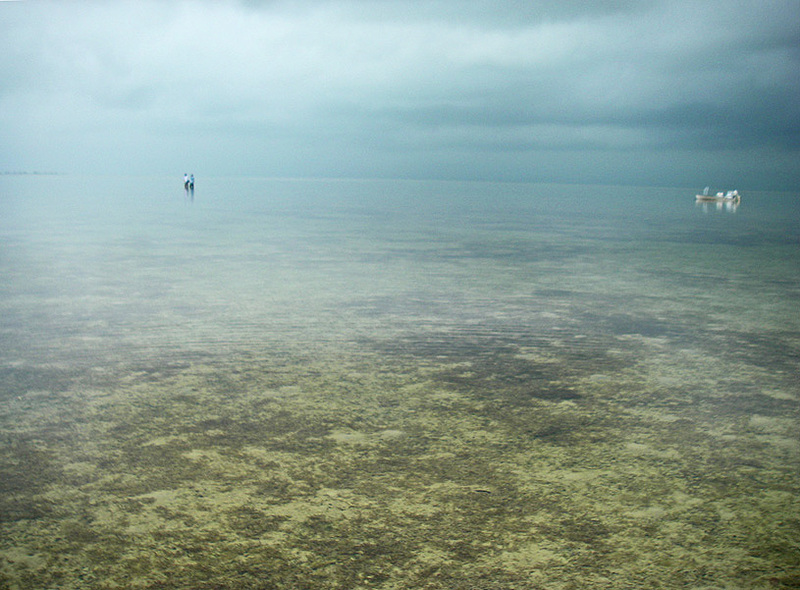 Even though we were still under a high overcast, it was flat calm and the storm clouds appeared to be moving away. Sid, Mike and I anchored the skiff and got out to wade when we spied a bunch of tailing bonefish. Naturally two small black-tip sharks drove those fish off the flats before we got off a single cast. We were quite a ways from the boat when Sid suddenly said we needed to turn back. Sid wades slow. He says if you make noise as you wade the bonefish can hear it a quarter mile away. But now his legs were pushing a bow wake and he obviously didn’t care. When Sid wades fast it’s seriously time to go. The storm clouds had reversed direction and were now trying to box us in. We had to push the skiff out to deeper water and then run underneath the front before it opened up. It was like that the rest of the day – fish a little, then dodge storm clouds, fish a little more etc. etc. But with Sid’s knowledge we still found fish and stung a few. I even got out and waded some so Mike and I could both fish. I stalked a fish along one sandy shoreline flat for several hundred yards before he finally tailed within range. Awesome stuff. That evening the fighting was fierce, but in the end the Kalik battle was won. There may have been a couple survivors hiding in the dark back corners of the cooler behind the broccoli, but we figured the next crew would finish them off. Trip Summation. 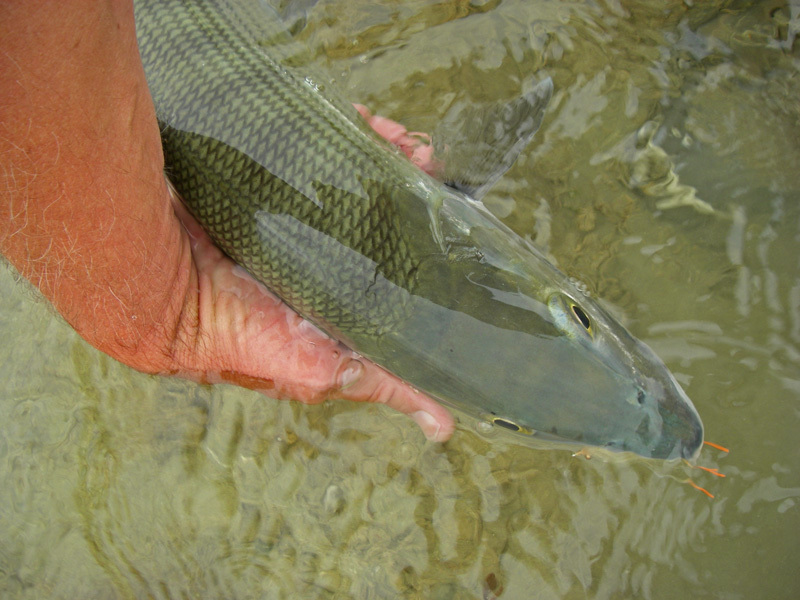 Live aboards remain the best value in fly fishing trips. We fished water rarely fished by shore-based lodges. The ability to move the boat maximizes your opportunities to access the best water and to adapt to changes in conditions. 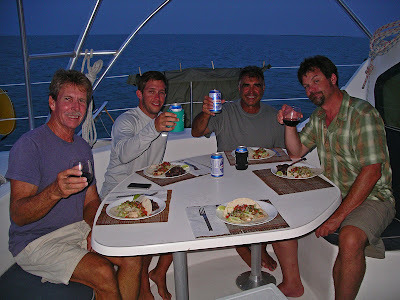 By moving the catamaran south on the 4th day we still had some great fishing. If we hadn’t moved, we’d have been plagued by high water the rest of the trip. 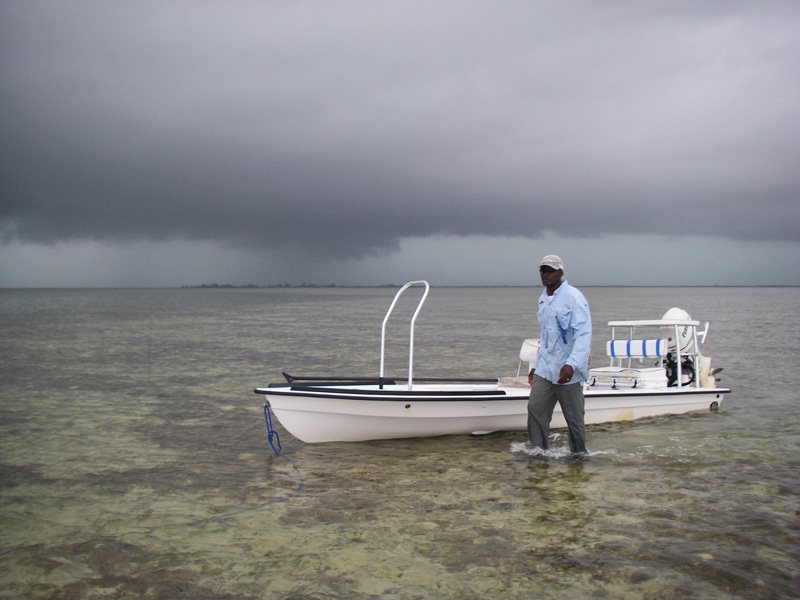 By moving your "bed" close to where you are fishing you maximize time spent fishing rather than riding in a skiff. The guides at Water Cay Lodge (Sid, Ezra and Greg) are some of the best guides in the Bahamas and they know the water they fish as well as most people know their backyards. In spite of the weird, freakish weather, they still put us on exceptional fishing. If you plan to fish around Water Cay, bring larger flies (size 2’s or large 4’s) tied with material that maximize movement – even when the fly is sitting still on the bottom. Bring flies with lead eyes, bead chain eyes and a few with no eyes because you’ll fish all types of water depth. I’d like to say thanks to Mike Kotrick and John Frazier for sharing a skiff, a flat, a beer and a few laughs with me. Thank you also to Dave Calvert and Steve Hogan for providing a great home away from shore and some fantastic food. And especially thank you to Sid and Ezra for another exceptional effort during some pretty trying weather and tides. You guys made the trip for us and I thank you.